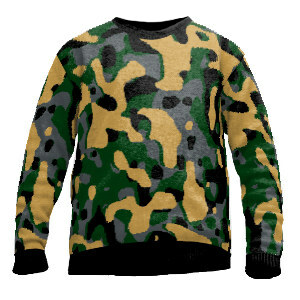 Edit design Knit sweater camouflage , or create your design from scratch. Knitted camouflage sweater, made to order with your design from 1 pc. Fishing, hunting or roaming the woods, no minimums. Design your custom knitsweater with your logo or text. Choose 4 colors from the color palette and create your outdoors design sweatshirt. Only at Wildemasche.